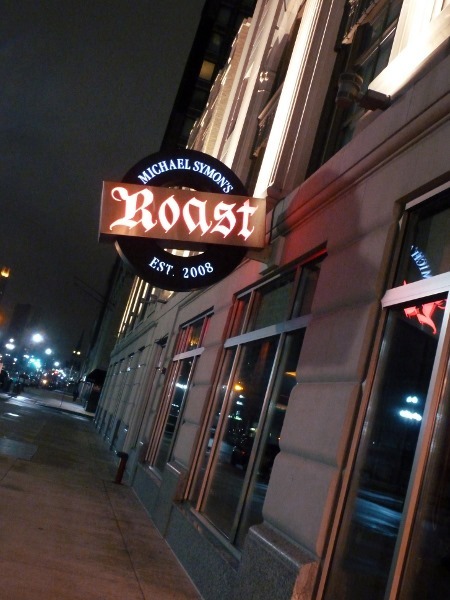 Last spring, Five Star SexiMexy and I checked out chef Michael Symon’s restaurant Roast in Detroit for happy hour. And I kind of haven’t been able to stop thinking about the food ever since. Um, yeah. I really need to return SOON! We had incredibly buttery Roast Burger, Goat Cheese Mac ‘n’ Cheese, and Ice Cream made with my favorite beer, Edmund Fitzgerald Porter. Oh, and also amazing craft cocktails. 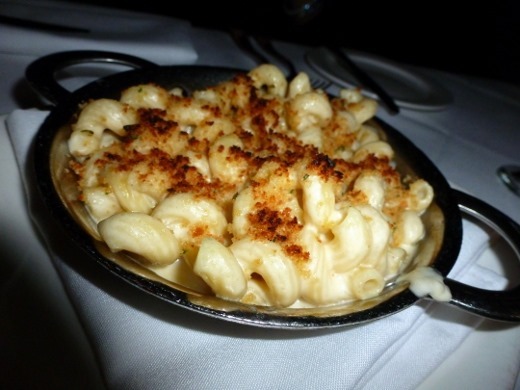 The other day I was surfing the web looking for something delicious to make myself for dinner and I came across Michael Symon’s Goat Cheese Macaroni and Cheese recipe on the Food Network website. Um, JACKPOT! 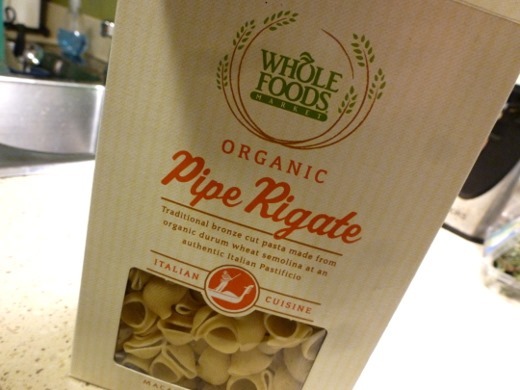 I immediately drove to Whole Foods to get the ingredients. No joke. 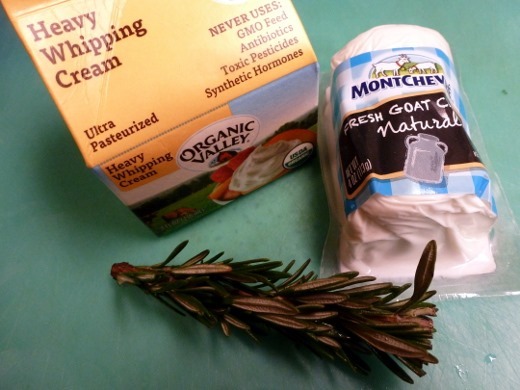 If you even remotely like goat cheese at all, you MUST make this recipe. The best part? You’ll only need four ingredients. That’s right. I said FOUR INGREDIENTS. Well, six if you count salt and pepper, but I don’t count salt and pepper. And that’s IT! This dish comes together in minutes and tastes simply gourmet. 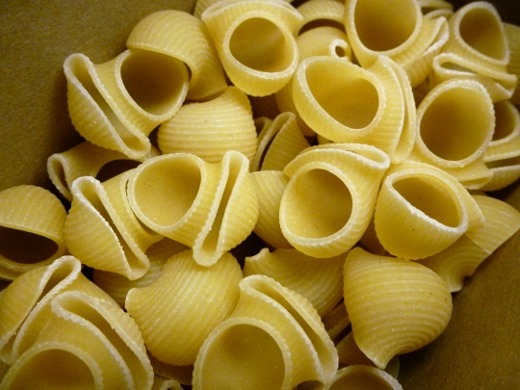 First, cook your pasta al dente, per the package directions. Meanwhile, finely chop fresh rosemary. Add it to the heavy cream in a large saucepan Heat gently, until reduced by about half. You’ll want to slowly heat the liquid, stirring frequently. Once the mixture has reduced, season to taste with salt and pepper (maybe start with 1/8 tsp each), add in the fresh coat cheese, and stir until melted and incorporated into the sauce. 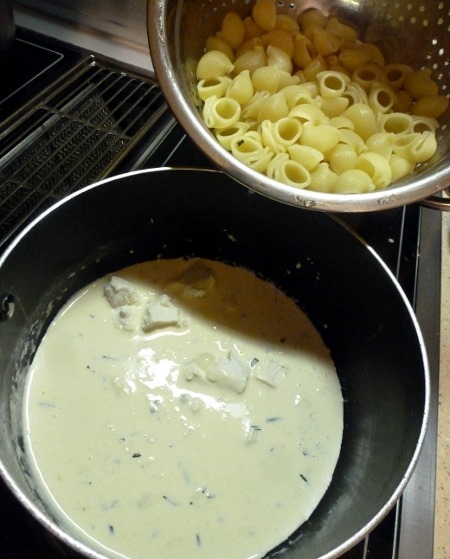 The final step is to simply drain your cooked pasta, and then toss it with the goat cheese cream sauce. That is it! Can you believe that’s it?! There is no fussy roux, no baking, that’s it. Though if you wish, you can toast a few breadcrumbs to sprinkle on top, like Michael Symon does in his restaurant Roast. I placed a couple tablespoons of panko breadcrumbs on a small baking sheet and toasted in my toaster oven. A striking resemblance to the restaurant version! Mine (above) vs. Roast’s (below). This recipe is legit. I rounded out my meal with roasted brussels sprouts. Best dinner! I omitted the chicken, along with the olive oil and paprika that are added to the chicken. I also scaled down the original recipe by 75%, to serve 2 instead of 8. 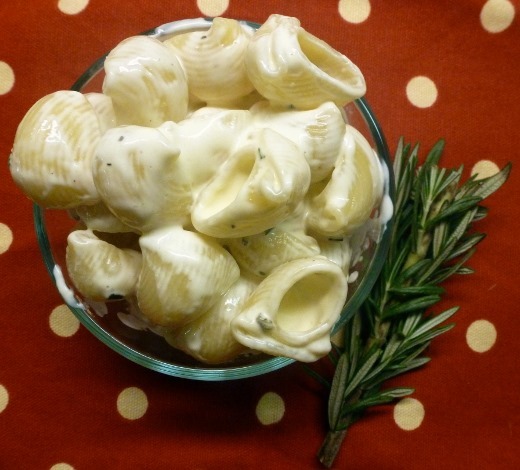 Additionally, I substituted rosemary in place of thyme, per the suggestion of many people who reviewed the recipe. I absolutely recommend this. 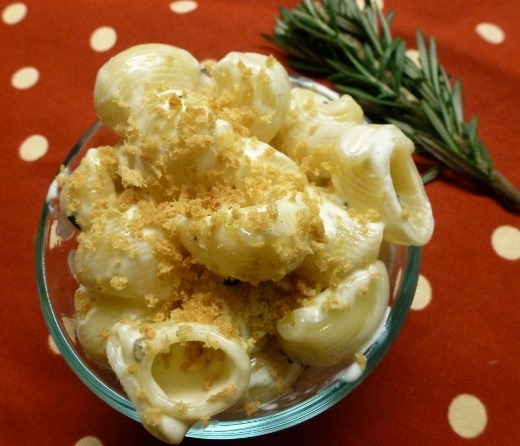 Here is a link to the original recipe if you’d like to check it out: Goat Cheese Macaroni & Cheese. Cook macaroni al dente, per package instructions. Drain and set aside. 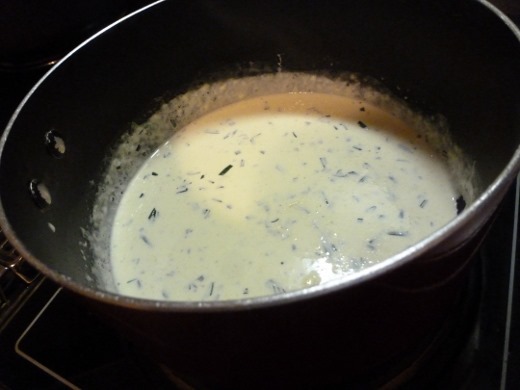 Heat cream and herbs gently in large saucepan, stirring frequently, and reduce by half. Add salt and pepper to taste (~1/8 tsp each). 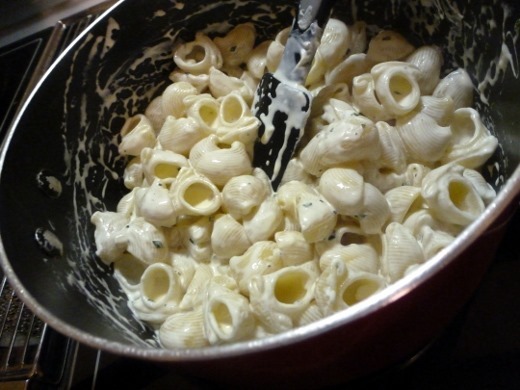 Add the cooked macaroni and goat cheese and simmer for 2 minutes. Remove from heat and serve. Sprinkle with toasted breadcrumb, if desired. PS – The winners to my giveaway have been announced! Please contact me at the email listed at the bottom of this post if you’re a winner, if you haven’t already. 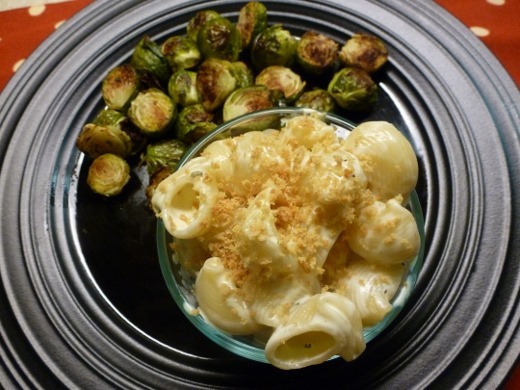 Pingback: Top Dinner Entrée Recipes of 2013–Part II | Meg.Goes.Nom.Nom.